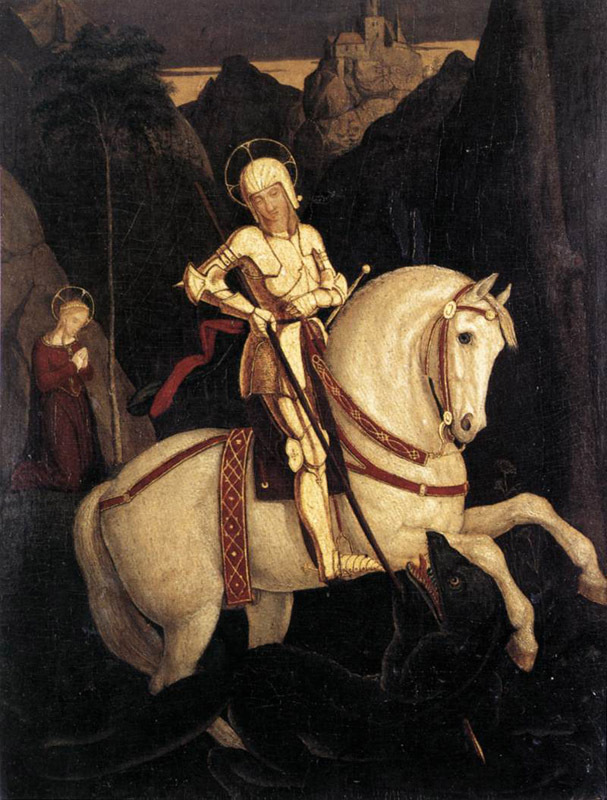 colour and line that had many sources of inspiration, including Fra Angelico, the early works of Raphael, and older northern masters from van Eyck to Durer. For the Nazarenes, art was a divine mission, elevated to the level of true faith. 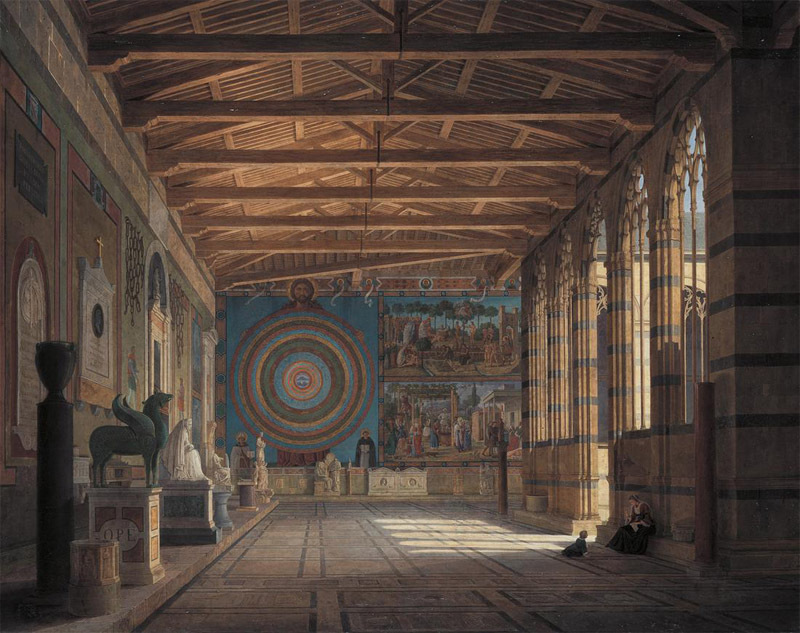 The celestial origin of sacred art was celebrated by Philipp Veit (1793-1877) in his frescos in the Villa Massimo of Rome (1819), where he represented the three great Italian poets - Dante, Ariosto, and Tasso -alongside the saints and fathers of the church. 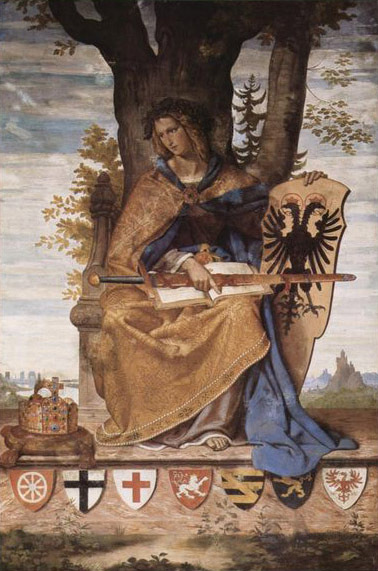 Between 1826 and 1839, Peter von Cornelius (1783-1867) gave artists sacred status in the loggias of the Munich Pinakothek (1826-30) and the Stadel Institute of Frankfurt with his Triumph of Religion in the Arts(1829). In portraits, there was a mood of contemplation. In the intimate portrayal of friends, pictures reveal subtle nuances of character, in a style far removed from the canons of official portraiture. The original spirit, derived from the masters of the 15th century that had brought the Nazarenes together, lasted only for a short time. The fresco cycles that decorated the home of the German consul Bartholdy (1816-17) and the Villa Massimo already showed affinities with the style of the Renaissance of the early 16th century. 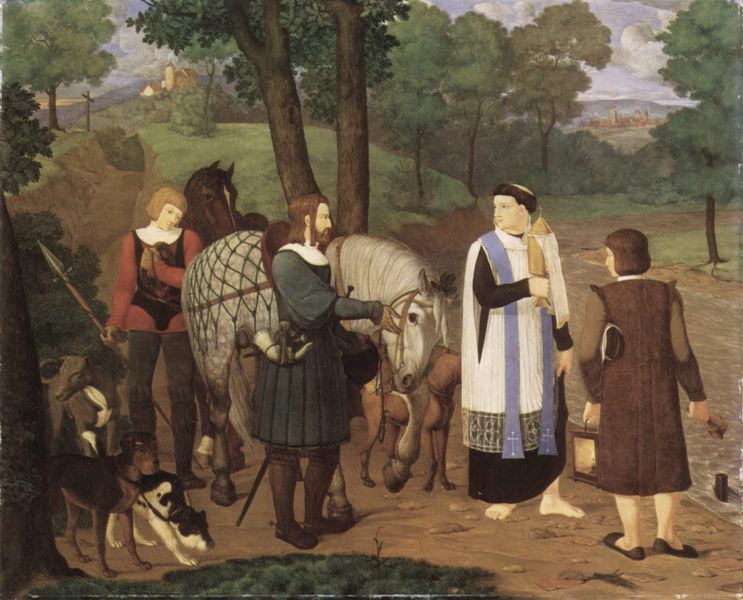 Pforr died before the age of 25 and Cornelius was summoned, together with Heinrich von Olivier (1785-1841) and Julius Schnorr von Carolsfeld (1794-1872), to Munich by Ludwig. 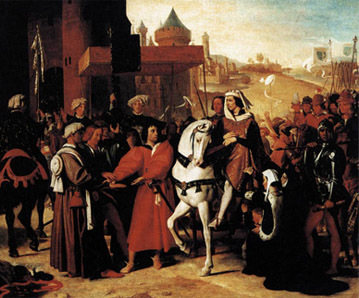 The king encouraged a popular, educational style of painting and commissioned them to adorn the city's public buildings with patriotic, humanistic frescos. 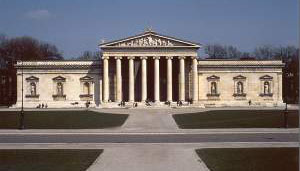 The art of the Nazarenes assumed an official role with Cornelius' paintings - which formed part of the Glyptothek (1819-30), the museum of ancient art designed in a Greek style by Leo von Klenze. 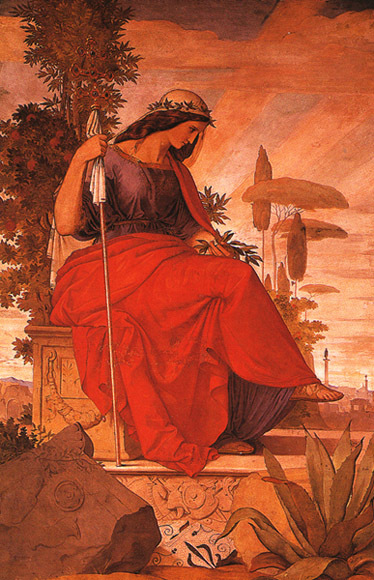 Thanks, too, to Carolsfeld's cycle of the Nibelungen (1827) for the Konigsbau (the royal residence in Munich open to visitors), an artistic interpretation of national mythology assumed an educational function. (b Frankfurt am Main, 5 April 1788; d Albano, nr Rome, 16 June 1812). German painter and draughtsman. He received his earliest training from his father, the painter Johann Georg Pforr (1745–98), and his uncle, the art professor and first inspector of the painting gallery in Kassel, Johann Heinrich Tischbein the younger (1742–1808). In 1805 he became a student at the Akademie der Bildenden Künste in Vienna, which was dominated by the severe Neo-classicism of its director, Heinrich Füger; he was taught by Hubert Maurer (1738–1818), Franz Cauzig (1762–1828) and Johann Martin Fischer. During the war with France in 1805, Pforr volunteered as a guard in the Vienna militia. He suffered a nervous breakdown, brought on by the conflict between his passionate longing for a contemplative life and a desire to see military action. He probably turned to religion to help sustain his mental equilibrium. In 1806 he resumed his academic studies and, believing himself destined to become a battle painter, made numerous drawings of historical battles, for example his still schoolish and baroquely composed Wallenstein in the Battle of Lützen (1806; Frankfurt am Main, Städel. Kstinst. & Städt. Gal.). However, it was not until 1807, with Drawing with Twelve Travel Sketches (Frankfurt am Main, Stadt- & Ubib. ), that he first began to overcome his beginner’s style and to develop his own. This resulted in reduced detail, simplified continuous contours, a structuring by means of planar rather than illusionistic criteria, a new clarity of vision and a chastened balance between nature and artistic conception. Certain similarities tan be found between the puritanical spirit of Pforr and the style of Ingres, which was defined by David and his school during a particular period of the artist's activity as "Gothic" and "dry and clipped". 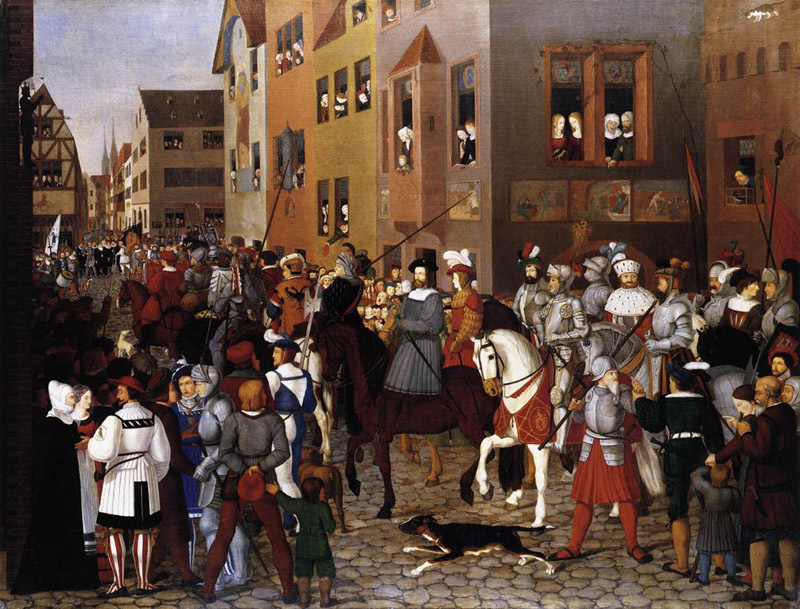 In Pforr's The Entrance of Rudolf of Hapshurg into Basle in 1273, the minute detail of faces and costumes of the animated crowd filling the narrow streets seems to be an informed interpretation of a scene from medieval life; in fact, the painting displays anachronisms that spring from the wish to revive a lost age. 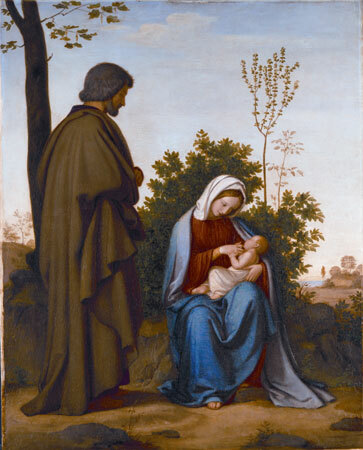 In his Entry into Peris of the Dauphin, the Future Charles, Ingres discarded the excessively-primitive nature of Gothic painting, as revived by Pforr, with its absence of atmosphere, depth, and pathos, preferring soft brushwork to the dry technique of the Nazarenes. 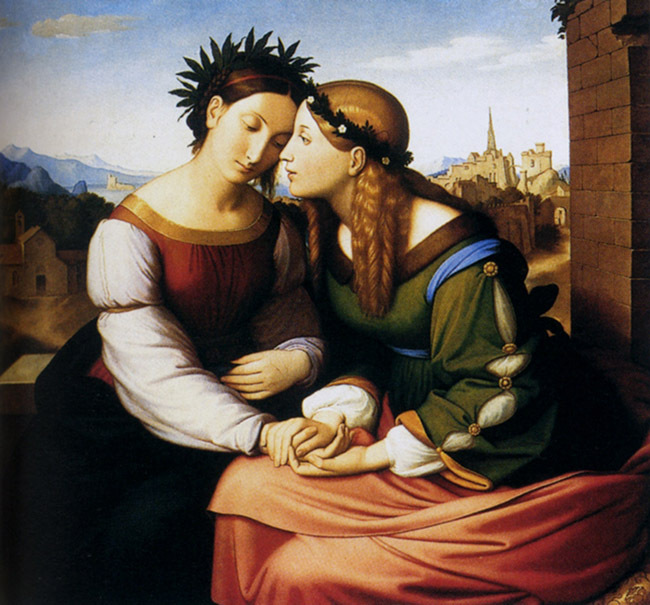 Overbeck's Italy and Germany, the women representing the two extremes sit happily together. 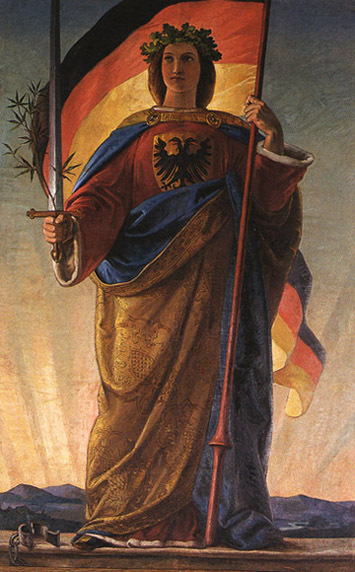 (b Berlin, 13 Feb 1793; d Mainz, 18 Dec 1877). German painter. The stepson, from 1804, of Friedrich von Schlegel, he studied (1808–11) at the Akademie in Dresden under Friedrich Matthäi (1777–1845) and Caspar David Friedrich. He showed talent in drawing but, on moving to Vienna in 1811, had difficulties with painting in oil, and turned to watercolour. Through Schlegel, Veit came to know many of the leading Romantics in Vienna, such as the poet and novelist Joseph von Eichendorff. In 1813–14 Veit took part in the campaign against Napoleon and returned briefly to Berlin. 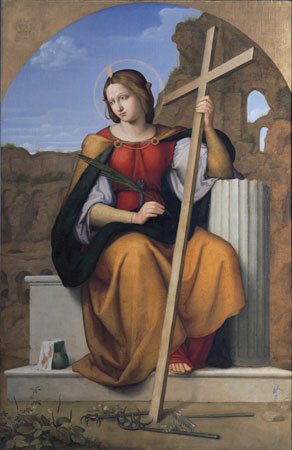 In 1815 he completed a votive picture, the Virgin with Christ and St John, for the church of St James in Heiligenstadt, Vienna, inspired by the work of Pietro Perugino and Raphael. 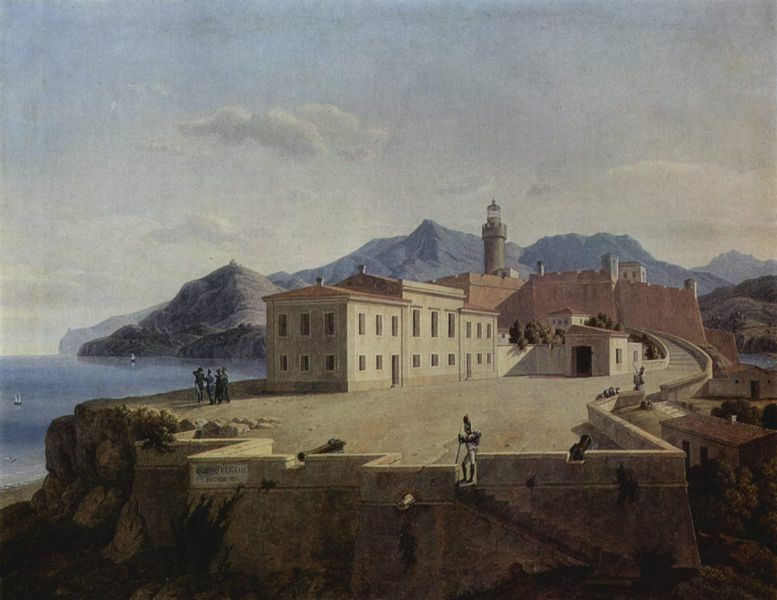 In 1815 Veit left for Italy where he stayed until 1830. 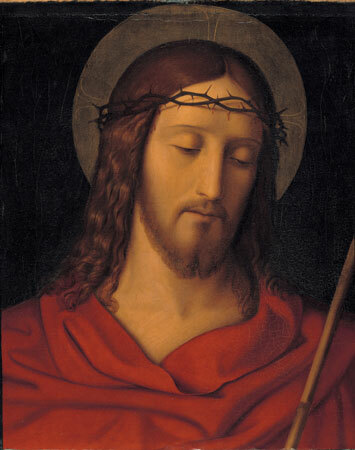 In Rome he joined the circle around Friedrich Overbeck and Peter Cornelius, becoming a leading Nazarene. 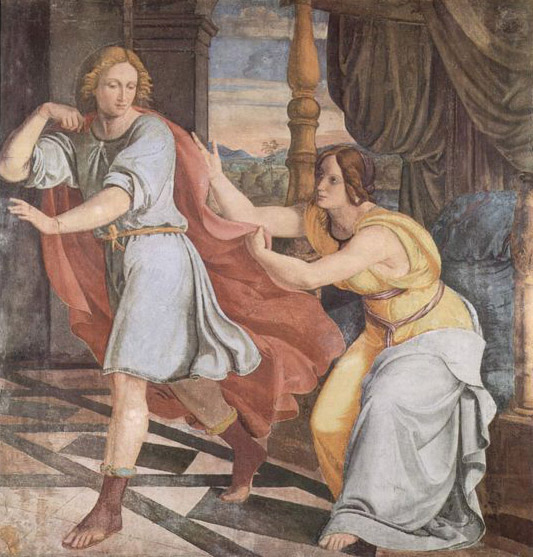 With these artists he took part in providing fresco decorations (1816–17) for the Casa Bartholdy (now the Bibliotheca Hertziana): Veit painted the scene of Joseph and Potiphar’s Wife and a decorative lunette allegory, the Seven Years of Plenty (both now Berlin, Staatl. Mussen, N.G.). In 1818 Veit was commissioned to paint the fresco of the Triumph of Religion in the Museo Chiaramonti in the Vatican, one of a series of murals recording the services of Pope Pius VII to science and art. Veit also took part in the decoration of the Casino Massimo in Rome (1818–24), painting the ceiling of the Dante Room with the Heavens of the Blessed and the Empyrean. 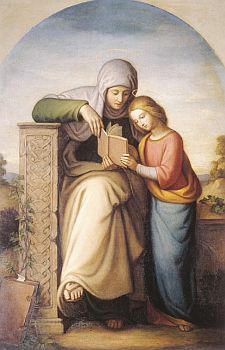 In these frescoes and in his Maria Immaculata in Trinità dei Monti (1829–30) Veit proved himself the finest colourist of the Nazarene artists. 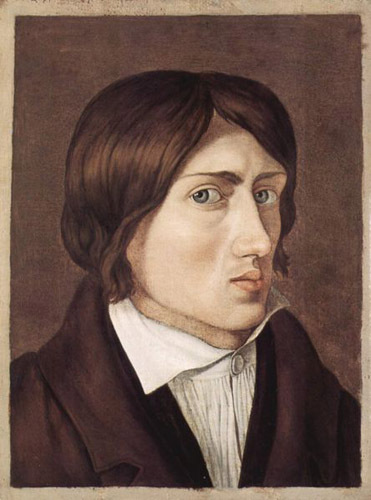 While in Rome, Veit also painted some excellent portraits, notably a Self-portrait (c. 1816; Mainz, Landesmus.). He also produced a fine series of pencil drawings of his fellow German artists in Rome (e.g. Mainz, Landesmus.). An architect, painter, and writer, Leo von Klenze is most noted for his work as court architect to Ludwig I, king of Bavaria. He designed streets, squares, and numerous monumental buildings that set the scale and tone of Munich, the Bavarian capital. 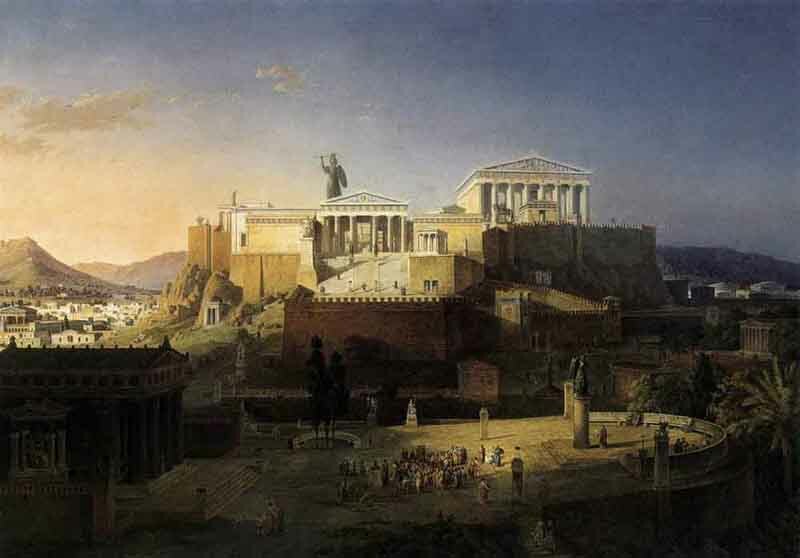 His other European commissions ranged from Athens, where he was the first to take steps to preserve the Acropolis, to Saint Petersburg, Russia. 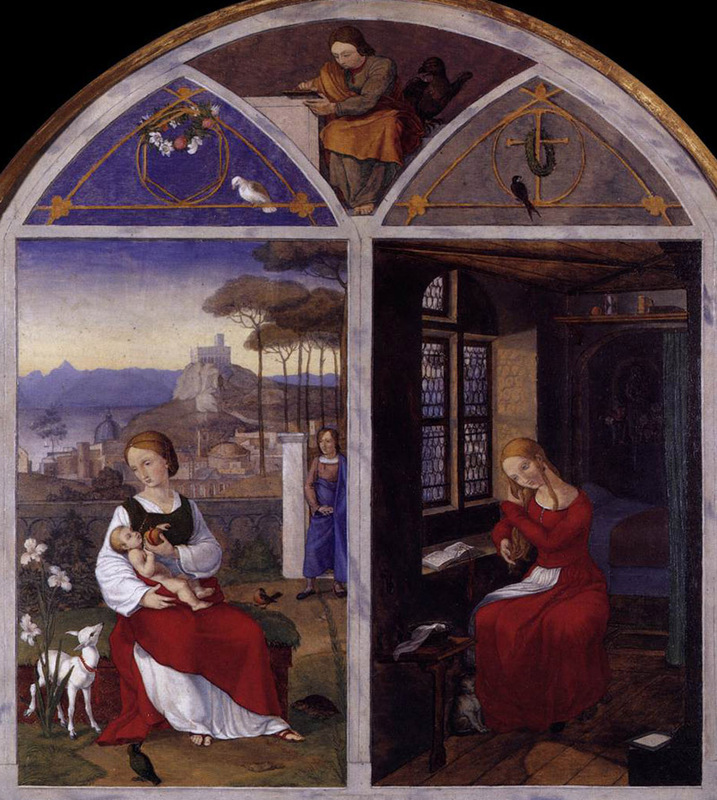 In addition to building, Von Klenze studied public building finance, designed and arranged museum galleries of ancient art, and was an accomplished painter. His paintings exhibit a richness of detail and special attention to light and compositional space. He successfully combined his talent for sharp observation with an equal and complementary ability to improve upon nature. 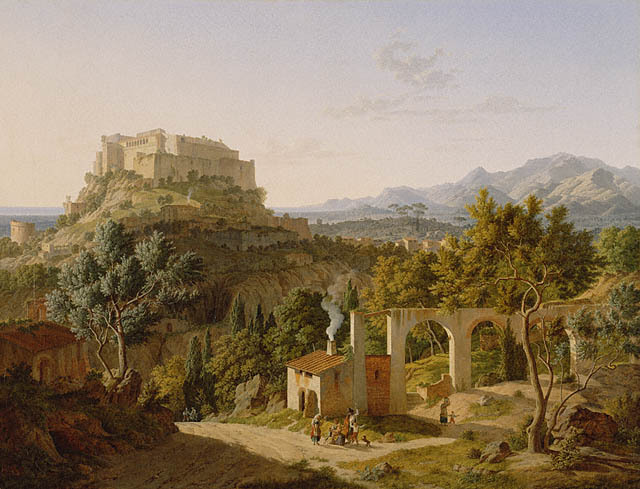 On his visits to Italy, he both drew and painted landscapes and examined the remains of Greek temples as sources for his archaeological Greek style.